Home Creative Table Settings & Inspired Crafts Dine Under the Tuscan Sun in Your Own Home! Dine Under the Tuscan Sun in Your Own Home! Dine in Tuscany any day of the week! Create an Italian-inspired Tuscan table with colorful plates and goblets in bright colors. 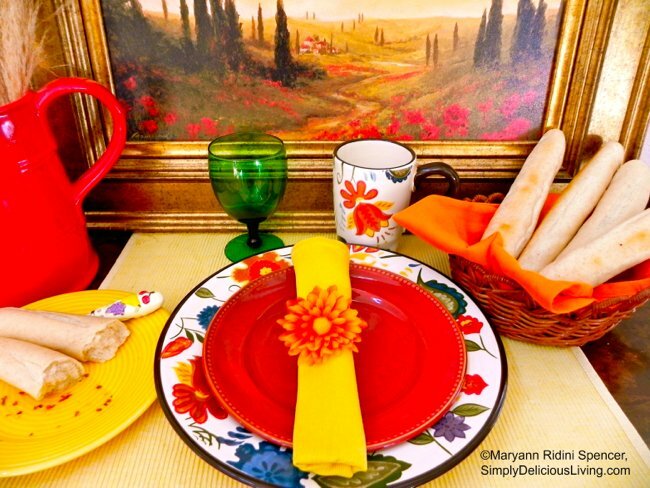 For this setting, I used the painting in this PHOTO as my muse — mixing colorful plates and bright table decor to match the Italian flavor. I also picked up a few fake flowers at Michael’s and attached them to napkin holders to create a pretty focal point. Get some ideas for your table! Just Google “Tuscany Illustrations and Clip Art” or “Tuscan Stock Illustrations” and download a photo or two. If you’d rather take an excursion to another locale such as Greece, France, or a tropical locale, just Google photos of those regions to inspire you and then let your imagination flow and have fun!!!! Delicious Stress-Reducing Weekend Getaway Idea!